For centuries, the elegant white rose has been treasured as a symbol of purity, young love, and anticipated joy - making it the perfect accent for weddings, showers and so much more. And this pretty candle favour showcases the white rose in all its glory! 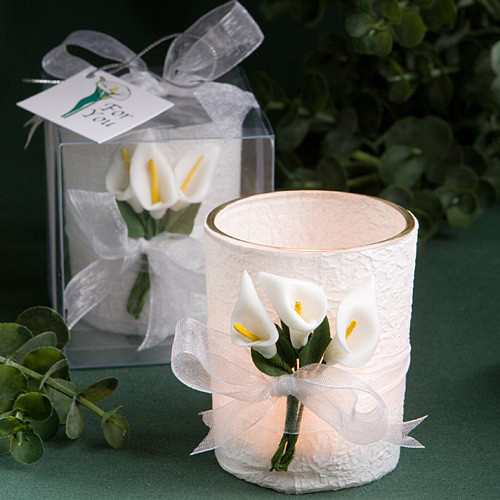 A Porreda exclusive, each candle favour measures 2.5" x 3" and features a clear glass votive holder, elegantly wrapped in a textured white paper and adorned with two cloth white rose blooms side by side, with green stems and leaves, wrapped and tied with a white organza bow in the front to create the look of a bouquet. 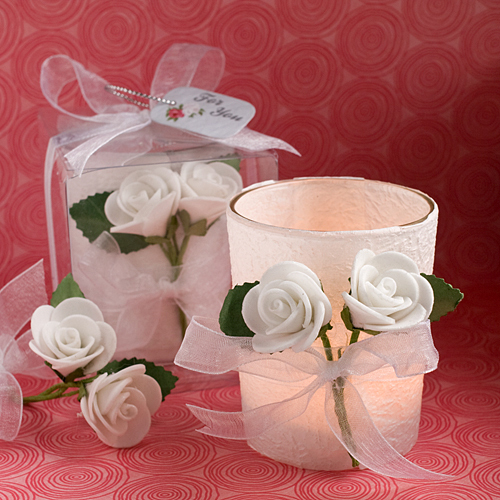 A wonderful addition to any occasion, each comes in a clear gift box with white tea light candle included, tied with a white organza ribbon and an attached rose themed "For You" tag.